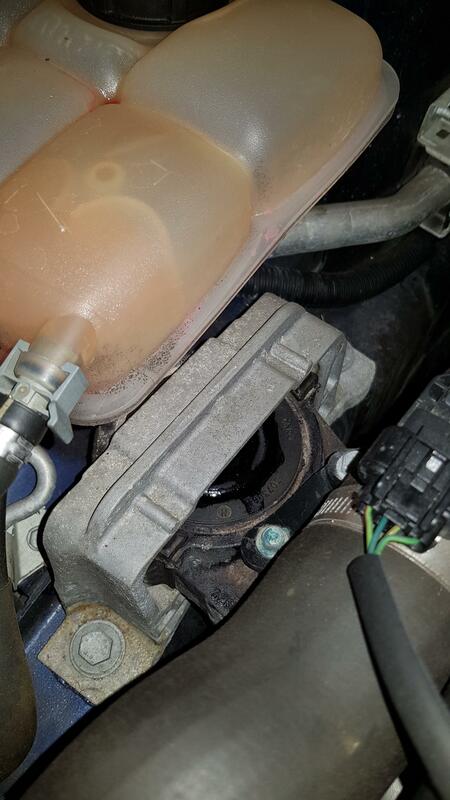 I've been checking my coolant over the last few days and noticed something on one of my engine mounts. It never seems to get worse nor does it go down. Was wondering if anyone can shed some light as to what it might be? My level doesn't seem to be going down so at a loss as to what it could be? I can't say for sure but it's got to be a good sign if your coolant level isn't going down. The engine mounts are oil filled so could be leaking. Keep an eye on it. 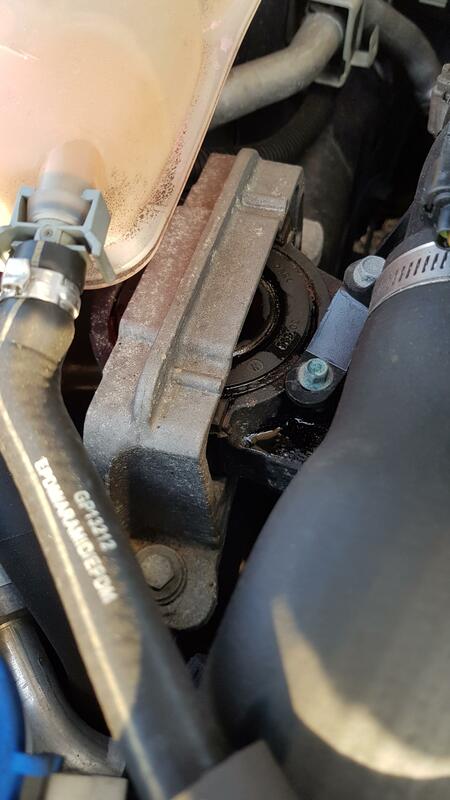 The severe discoloration of the coolant reservoir is one of the symptoms of deterioration of the plastic material. You should inspect the reservoir thoroughly and in case any (micro)cracks are found the coolant reservoir and coolant reservoir cap should be replaced. Based on the severe discoloration I suspect that there is a huge chance that the reservoir already developed (micro)cracks. Below some pictures of a coolant reservoir that was less than 3 Years old when I changed it. In case of any doubts the reservoir should and reservoir cap should always be replaced. These are inexpensive parts that can prevent a lot of trouble. Thank you for that. My paranoia may have paid off if I get that sorted. I won't be able to do it myself, so will have to get a local garage to sort it out. 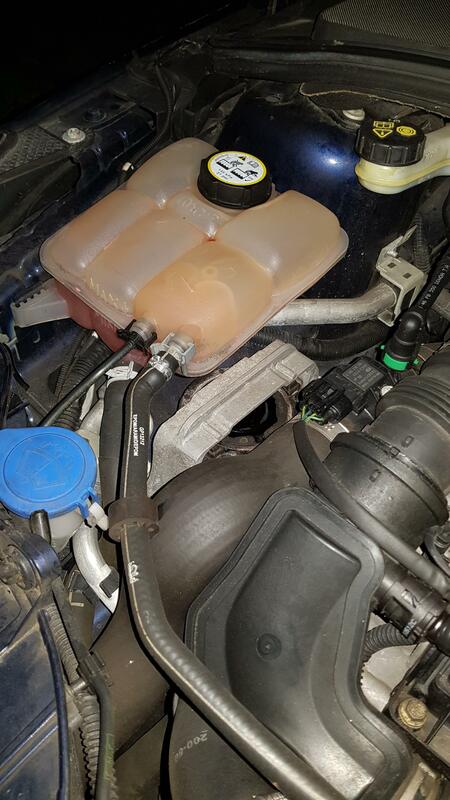 I'm worried though that if a local garage swaps it out they'll mess with the fragile coolant system and it will just develop another fault somewhere else? I did rub my hands around the casing after turning it off didnt feel any liquid. I did spill coolant over the top when I topped it up a week ago. Must admit, 10 minute drive, damm the engine gets hot in that time! With regards to the mounts and possible leakage, what's the potential damage and cost of replacement? Do you have the part number for it at all? Going to order a replacement online. Just had a look. They only do the cap and a hose. Well that order was canceled as out of stock - So had to pay a little more @ £23 but its now on its way. Found a garage that will fit all this stuff for me (one already turned me down as didn't want to touch the coolant system on this car). So we will see. Been quoted £195 ex VAT for fitting the complete retrofit system inc electric pump. Just needed to source the bits myself. At least once its done I should be able to rest easy. I found that my coolant tank had a crack on the underside of it due to the coolant pooling in the exact same place as your first pic. You may aswell change it now so you have some piece of mind! Ok I think this is defiantly the engine mount. It got worse last night and today, see attached. 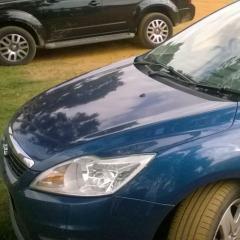 You can also now see around the rim of the rubber on the mount where is now missing... Anyone got any idea on a price this may cost? Also a part number for it would be great if anyone has it. As I doubt ford will quote a decent price so if I can source it myself. I dabbed the fluid with my finger and it a very dark thick liquid with a tinge of red. If it was coolant I'm sure it would be a lighter red and thinner? 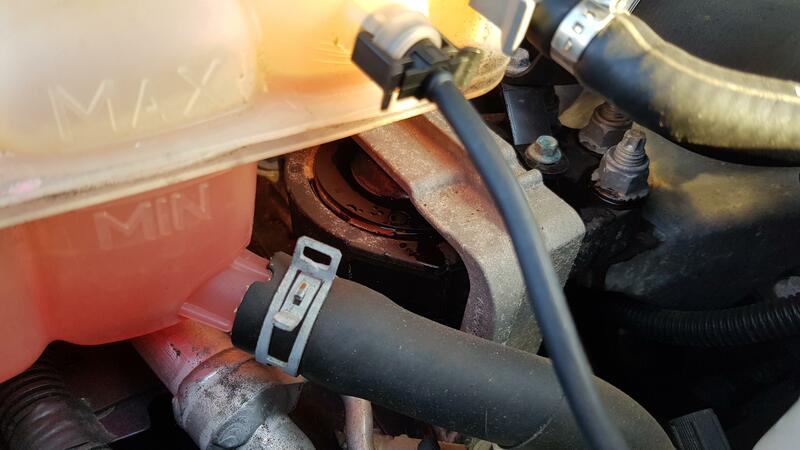 Degas hoses changed to mk3.5 versions, coolant tank and cap swapped, electronic coolant pump retrofitted... and to top all that, garage confirmed it was the engine mount leaking, so had that changed too. Hopefully my worries over the coolant system will now go away. Shame the mount replacement wasn't covered under my warrenty, that was a £200 job on its own. But I'm hoping that with all of this done now the coolant system on the car is as safe as it can be now. Hopefully worth it in the long run. Ok it appears my local FORD SPECIALIST! is having trouble programming the PCM for this pump. Has anyone got the process documented on how to do this? They've told me the have the latest IDS tech, so really not sure why their having troubles? If a software update is available the IDS program should ask if TSB 35/2012 (installation of the electric coolant pump) has been performed or not. Depending on this choice the program automatically selects the correct software version. In case the car already has the latest available software version the update procedure can be forced by performing the non-com procedure. When connecting the IDS program to the car make sure that the ignition is switched off. The program will still try to connect and will show several warning messages to switch the ignition on or off. Proceed but make sure that the ignition remains switched off. After a few attempts to connect to the vehicle the IDS program will offer the possibility to select the car manually by the tear tag number or the PCM hardware number. After selecting the PCM hardware number (this number can easily be found on the Etis website) the software loads the correct vehicle functionality without actually connecting to the car. Next go to the module programming section and select the function to change a module. select PCM and start the procedure. During the procedure the program may ask to switch the ignition on/off a few times. Proceed but make sure that the ignition remains switched off. proceed once the program instructs to replace the PCM module and switch the ignition on. This is acually the first time that the ignition must be switched on. Now the IDS software should ask if TSB 35/2012 (installation of the electric coolant pump) has been performed or not. Depending on this choice the program automatically selects the correct software version based on the hardware version of the PCM. Thanks for this. I picked up my car today. The guy that fitted it said he spoke to a ford tech about the coolant pump And the ford tech said that the pump only comes on during a drive while towing if it detects high temps... and doesn't stay on after the engine goes off? Come someone confirm it's correct function please? Oh and since the garage has had it, the push to start button seems to now have a 1 second delay on press... before it was almost instant. On the plus side, the mount replacement has made it feel like the engine isn't even running while on... love it! The coolant pump won't come on unless the temps are high. But will come on just by driving it normally to an extent. I've got a section of bypass just before I get home and if I'm in a hurry , the coolant pump kicks in after I switch ign off. Don't hear it , but once in a while I open the bonnet just to see if it's working as it should. Ah ok. Best to have it as a backup then :). Now that the hoses and pump have been changed, is there anything else I can do to prevent any future failures as a precaution? Not that I can afford it, but I'd now like to start 'improving' my car, be it internal or external? Bit off topic of this thread, but would a stage 1 map be 'safe' now do you think as that was next on my to do list? Don't see why not. I did mine about 2 weeks after buying my 2013 focus in Oct 2014 at 25k . Now on 71k and going strong. Used bluefin handset remap. Would the bluefin map wipe out the PCM config for the pump though as it wasn't standard from build?